In recent years, the culture wars have included arguments about the way that slavery is taught and remembered in books, films, television programs, historical sites, and museums. 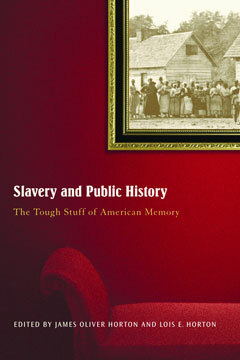 In the first attempt to examine this phenomenon, Slavery and Public History looks at recent controversies surrounding the interpretation of slavery’s history in the public arena, with contributions by such noted historians as Ira Berlin, David W. Blight, and Gary B. Nash. From the cancellation of the Library of Congress’s “Back of the Big House” slavery exhibit at the request of the institution’s African American employees, who found the visual images of slavery too distressing, to the public reaction to DNA findings confirming Thomas Jefferson’s relationship with his slave Sally Hemings, Slavery and Public History takes on contemporary reactions to the fundamental contradiction of American history—the existence of slavery in a country dedicated to freedom—and offers a bracing analysis of how people remember their past and how the lessons they draw from it influence American politics and culture today.